Ziplining is just one of those enjoyable activities that is fun to do no matter where you are. Naturally, some ziplines are more enjoyable and adventurous than others. 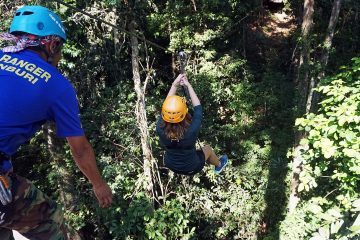 As we are big thrill seekers, the quick zooming across high ravines combined with beautiful scenic views, are just a few reasons why ziplining is always an activity we look for when we travel. Researchers began using these cables in the 1970’s in Costa Rica as a way to get from one side of the rainforest to the next faster. Shortly after, they discovered the eco-tourism opportunities which then became the start of a global ziplining craze. To help you out, here’s a list of the best places to go ziplining in Asia from tree top canopy adventures to adrenaline filling zooms down canyons. While there are multiple ziplines in Thailand, the Flight of the Gibbon is one of the best experiences as it combines eco-tourism, sustainability, and adventure. The smaller ziplines located in the Thai islands are also pretty fun to do mainly because of the stunning views that it showcases. Flight of the Gibbon: Imagine yourself zooming through this widespread jungle canopy. As you fly and zoom past the jungle the sound of birds and cicadas fill your ears. The wind blows upon your hair as you take in as much of the scenery as you can. 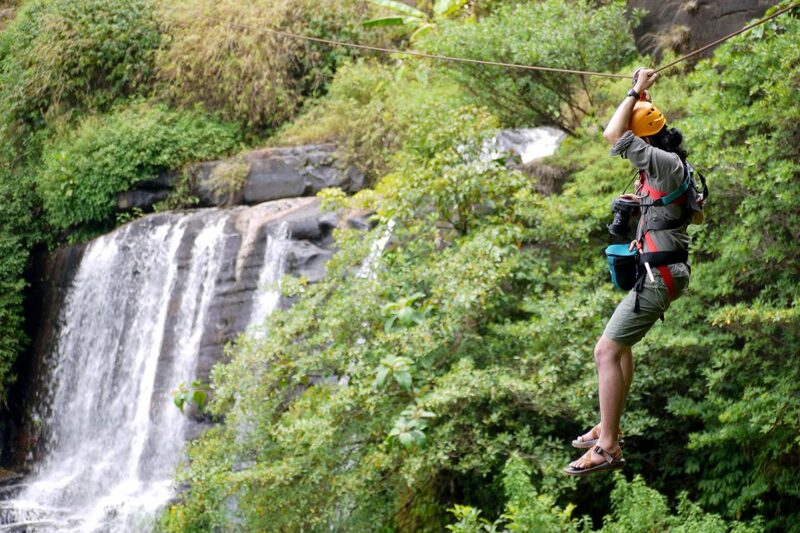 The Flight of the Gibbon is Thailand’s premier ziplining and rainforest tours. Home to one of the most scenic zipline canopy tours in Asia, the Flight of the Gibbon is a series of ziplines, with some portions extending about 800 meters long, suspended 50m above the valley floor. Not only are you able to get your adrenaline fill, if you’re lucky, you might even be able to spot exotic wildlife like Gibbons and birds. The best part about The Flight of the Gibbons is that they reinvest portions of their proceeds to reforestation and introducing various animal species back to the forest. Home to many ziplines (around 20 spread all over the country), the Philippines is one of the best places in Asia to get in on the action. Lake Sebu: Suspended 500 feet high, the zipline in Lake Sebu is one of the highest in Asia. Ever dreamed of flying? Well this is your chance as this attraction makes you feel exactly that. Visit the 7 waterfalls that are located all over the zipline area. While the first two are accessible by trekking, the best way to see the other waterfalls are by ziplining across. Glide across the stunning rivers as you loom over the waterfalls and lush forested areas. The ziplines are high (and long) and are loads of fun to try! Laos has made use of their lush environment by incorporating multiple canopies and ziplines spread all throughout the country. Green Discovery’s Tree Top Explorer: Located in the Champask province, you have tree houses, suspended 20 meters high. Not only is it an awesome place to sleep but touring their resort grounds by roaring over gorges via ziplines makes this a unique experience. The same company also offers the Nam Lik Jungle Fly in Vientiane which is home to a zipline 37 meters high that stretches out 180 meters long. Giant nets, ropes, and slings are also strategically placed around the area. The Gibbon Experience: The Gibbon Experience is another very popular tour which combines sleeping in a treehouse with trekking and extreme ziplining. 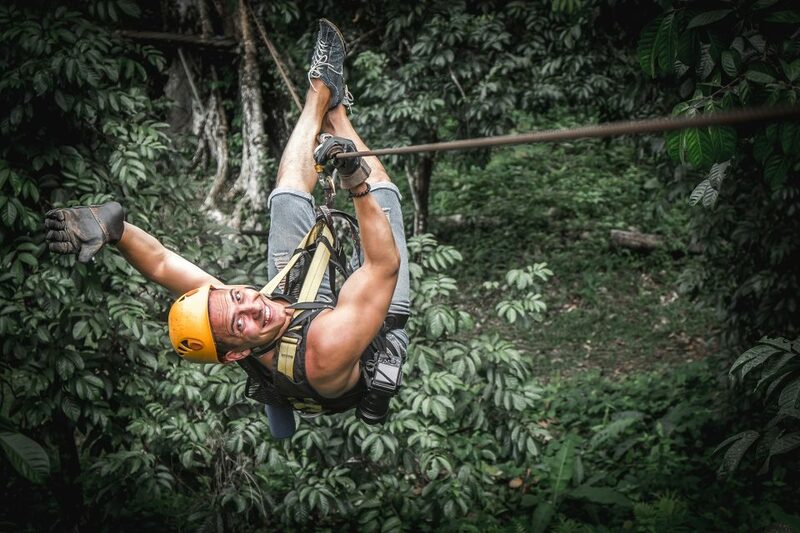 You can zip from one tree house to the next as the place has over 15km of ziplines spread across the park. 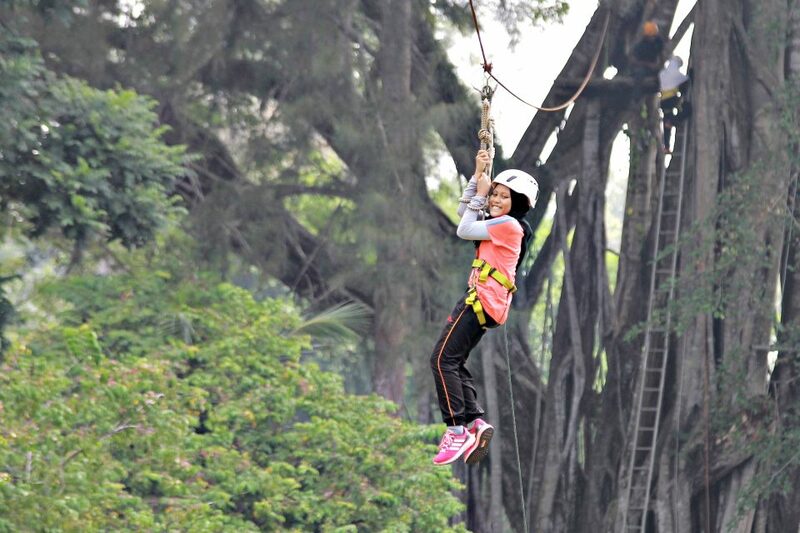 Malaysia is a popular place for ziplining which they also refer to as flying fox. Set amidst beautiful islands and lush rainforests, the ziplines in Malaysia are often combined with other adventurous activities like abseiling, wall climbing, and high rope walking which are bundled together as fun adventurous packages. Bukit Tinggi’s Flying Fox: Reaching a speed of about 70-80 kph, you soar over treetops and canopies with the zipline suspended 150 meters above the ground. 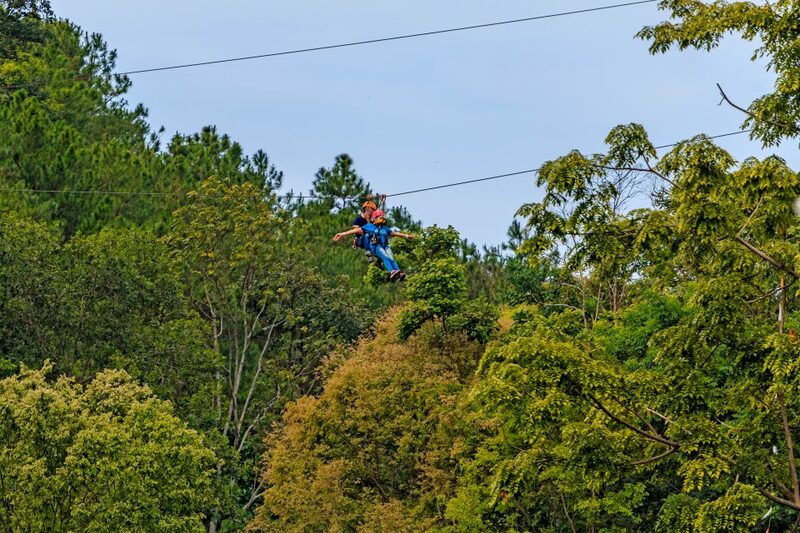 This particular zipline is part of the Aerial Forest Ropes park which combines multiple ziplines, aerial rope assault courses, canopy bridge walks, and rock climbing. Coral Flyer Zipline, Sabah: Although there are loads more flying foxes or ziplines in Malaysia, this one made it to the list as it is one of the longest island to island zipline, extending 250 meters in length. While it’s not the highest, imagine zooming over the crystal blue ocean getting the perfect birds eye view of everything around you? Flight of the Gibbon: Set amidst the dramatic Angkor archaeological park, the Flight of the Gibbon aerial course is a fun day activity to do. Combining ziplines with 21 tree latforms, sky bridges, and multiple spiral tree climbing along with a 50m abseil, you know you’re in for a fun adventure. The park is spread across 6 hectares full of various wildlife. Other ziplines to check out: High Point in Koh Rong Cambodia is a fun rope assault park spread across multiple trees and platforms. Bali Treetop Adventure Park: This multi level tree top park combines adventure circuits, suspended challenges, and various ziplines which go up to 160m long. Located in Bedugul’s Bali Botanical Garden, this place combines adventure and nature as you zoom past treetops. 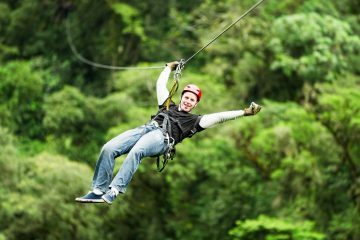 So whether you are looking for the closest thing to flying or you just want to conquer your fear of heights, ziplining is a fun and easy activity that you can do while traveling. I went ziplining this year (last year it sounded too scary) and loved it. I did it in Chiang Mai. Great to know that there are other places in SE asia where you can do it! Ive written them down for my next trip, thanks for sharing! Did you do the Flight of the Gibbon? 🙂 Let us know when you head back to Asia @stephaniestraveldiary:disqus would love to meet up! I haven’t thought to include Ziplining in my travel plans but will do now! Seems really fun! Nice roundup. I liked ziplining well enough but prefer exploring on the ground. 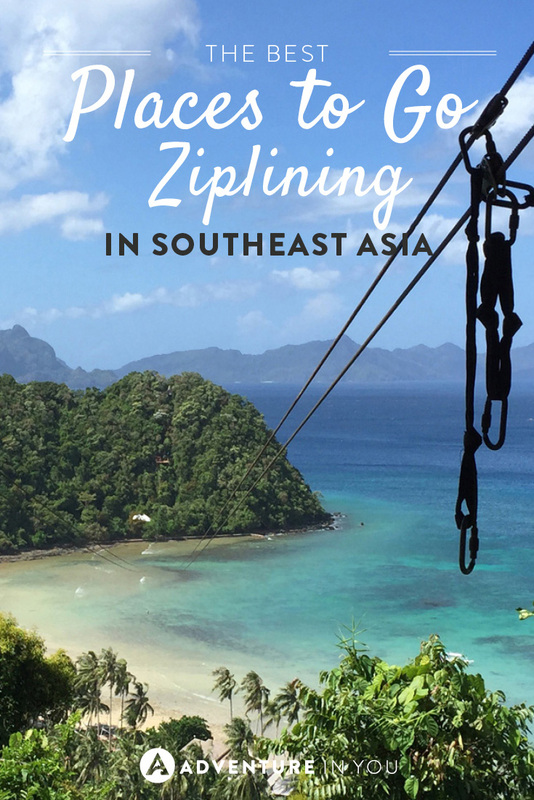 We did Zip Lining in Chiang Mai and loved it – but if I had to pick from any of the ones above it would have to be the Philippines – ziplining down towards that island above those blue waters would be incredible! I’ve never been zip lining, but these views are incredible! I may need to give it a try. I am adding it to my must do list there. I had been to Malaysia but missed out doing this. Awesome list! Bali is really high on my list so maybe I will make it to that zip line adventure sooner than later. Fab list! 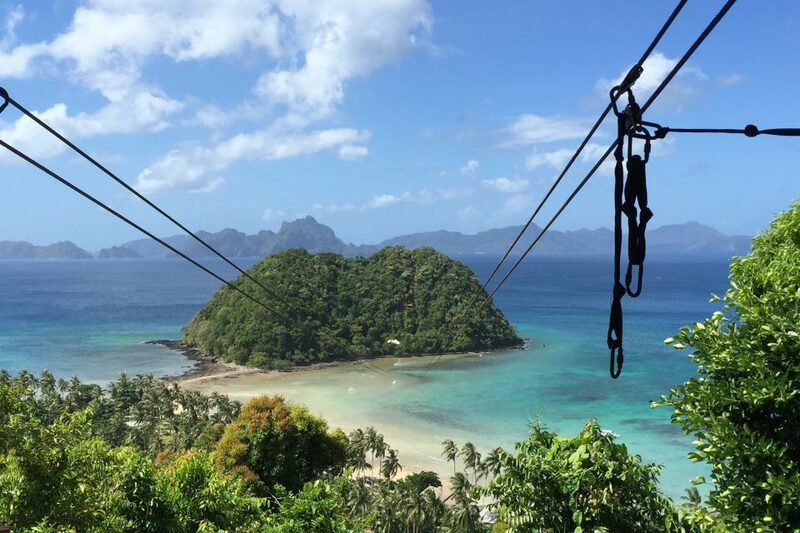 heading to the Philippines this week and I believe that Ziplining is on the itinerary for Boracay – can’t wait! The experience in Laos sounds amazing!! Then again I would love to do any of the ones you mentioned! Great list! It looks like fun and we’d absolutely give it a go in the right place. The views are incredible, especially that one in Boracay Island.